The MultiMix 3 from Braun with a unique ergonomic design is The perfect match for perfect results. The Brauna HM3105 hand mixer is a device that will make mixing not only quicker but more effective. 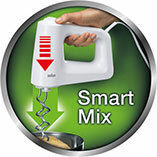 SmartMix - By placing the motor directly over the attachments, the weight is directed into the bowl, not in your hand. 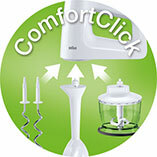 ComfortClick - Intuitively all attachments are fastened to the front, allowing the same comfortable hand position to be maintained no matter which attachment is used. 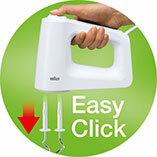 EasyClick - Conveniently switch whisking and mixing tools just one press of the large button. 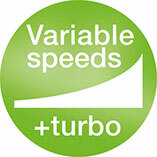 Variable Speeds - Adjust the speed dial from low to turbo with a flick of the thumb for better control and efficiency in preparing food. 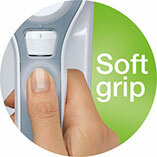 Soft Grip - Non-slip handle ensures a steady, cushy and secure grip even at the highest speed. 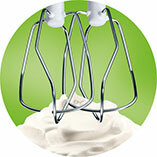 Whipping - Whips, beats and stirs easily eggs and cream, mixes cakes, muffins and home-made desserts. 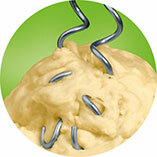 Kneading - The dough hooks are perfectly suited for kneading, making shortbreads and pastries. 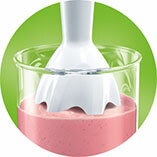 Blending - Perfect for blending smooth shakes, preparing ice creams or fillings for cakes. PowerBell - Patented hand blending technology for fine and even results. Anti-splash design ensures a spotless kitchen. Beaker - 600 ml plastic beaker, BPA free, with ml and fl oz measurements.